[Wilho Saari Jr.] is an abbreviation of the old family name, Leppäsaari, who trace their origins to the village of Halsua, in the Perho River Valley of Finland. This area of Finland is particularly noted for kantele playing. Wilho's grandfather Matti Leppäsaari (1867-1898) was the son of Anna Liisa Kalliokoski (1842-1891) who was the daughter of Kreeta Haapasalo (18131893), perhaps the most renowned kantele player ever in Finland. 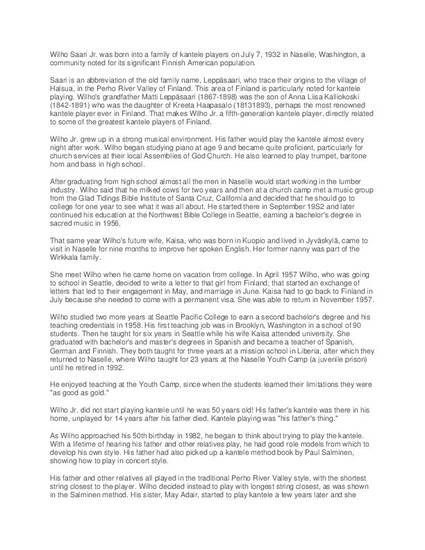 That makes Wilho Jr. a fifth-generation kantele player, directly related to some of the greatest kantele players of Finland. Most of Wilho's compositions are for 36-string kantele, but he has also composed for 5- and 10-string kantele. In the first six months after he received his 10string kantele, he had already composed 90 tunes for it! The vast majority of Wilho's compositions are short, many no more than 12 or 16 measures. But they are fully developed tunes, typically with an A and B phrase, each repeated. Unlike the traditional Perho River Valley repertory, few of Wilho's tunes could be considered dance tunes. His compositions are mostly in the style of songs, church music and folk music. Many of them have an overtly Finnish sound and others sound more American. As folk music, these tunes are universal. Wilho has also been greatly involved in teaching kantele. His own daughter, Karen Nelson is a fine kantele player and his grandchildren have also taken up the instrument. He has taught at kantele workshops, and coached the Livakat kantele ensemble in Portland, Oregon since 1999. Wilho was one of the leaders of the largest kantele ensemble ever assembled in North America at the 2011 FinnFest in San Diego. His teaching and performing have been an inspiration to kantele players around the world, but his most lasting legacy will undoubtedly be with his compositions.